I'm jealous, I still just have the VHS of that one. The used DVDs on Amazon are too pricey for me. I had never seen a physical copy of it and I just happened upon it. It was only $8.99 used, but the store was having a buy 2, get one for $1 sale + I have a discount card that takes off 10%. Just because of how the store rang it up, I got Kiss of Death for 90-cents! I received my Blu Ray of the Criterion release of The Marseille Trilogy today. Finally. That completes my collection of my top ten picks for each year of the 1930's. I also got the Criterion release of They Live By Night last week, which completed my 1940's Best-Of collection. I got Bring Me the Head of Alfredo Garcia, and 1492: Conquest of Paradise recently. I got a few from the Edward R Hamilton Bookseller catalog, too, including the Blu-Ray of Bonnie & Clyde (my DVD was one of the oldest in my collection, and looked it), and a few from Kino, the 1920 version of The Golem, the 1934 German sci-fi movie Gold, and Fritz Lang: The Early Works, which contains Harakiri (1919), The Wandering Shadow (1920), and Four Around the Woman (1921). I ordered my Trilogy today. So curious to see how it looks. I feel like a kid looking forward to Christmas. I had a gift card that I got last summer from work that I hadn't spent yet and it was set to expire on July 1. I had to get cracking. It'd be a shame to lose $100 because I couldn't decide what to buy. Anyway, so I finally spent it. TCM Greatest Classic Legends: The Thin Man. This set replaces the first four Thin Man films that were damaged in my flood. I repurchased #5 and #6 on their own. Now my set is complete again. Bob & Carol & Ted & Alice. I love this film and it only seems to air maybe once a year on TCM. This film is hard to find. I've never seen it in the store for sale. I've seen the empty tab for where it was supposed to be, but the store never seems to have a copy. Primrose Path. With Ginger Rogers & Joel McCrea. Now this film can leave my DVR. TCM Greatest Classic Legends: Jean Harlow. This replaces my copy that was damaged. I originally bought this set for the inclusion of Libeled Lady, which since then has been released on it's own by Warner Brothers as a MOD. However, this set also includes other delightful films like Wife Vs. Secretary and Dinner at Eight, so it was worth the re-purchase. The Affairs of Annabel & Annabel Takes a Tour. Finally the 'Annabel' series is on DVD. It's a MOD release, but it's available. I love The Affairs of Annabel and it only seems to air a handful of times per year on TCM. It's living on my DVR right now, so I'll be able to delete it. Trainspotting. I was surprised how much I liked this film when I watched it, as movies about addiction aren't normally my thing. But strangely enough, I found this film fun (if that's the right word for it). It had a little bit of everything. All it needed was Ewan McGregor singing. Lol. I also put the Dracula and Mummy sets on pre-order. "Frankenstein" is great. Really like Colin Clive in that role. Barnes & Noble's July Criterion sale started today--50% off! I was going to post something about this when I saw your's. I just ordered three from them, The Devil and Daniel Webster, and Blu-Ray upgrades of Nashville and McCabe & Mrs. Miller, as those two were on rather shabby DVDs. I'm trying to decide what I want. My husband owes me a birthday present. Lol. Right now, I want: Design For Living; The Palm Beach Story; It Happened One Night; Mildred Pierce; On the Waterfront; The Kid; and Woman of the Year. 'Design,' 'Waterfront,' and 'Kid' are the only ones I don't already own a (non-Criterion) copy of. But I really like 'Mildred,' so I'll probably get that and a couple others. I have the Criterions of both It Happened One Night and On the Waterfront, and can attest to their very high quality. So I settled on the three films that my husband is buying me for my birthday: Mildred Pierce, Design For Living and It Happened One Night. There are two more paydays until the sale ends. I may end up picking up some of the other films I want like The Kid and The Palm Beach Story. I kind of want Valley of the Dolls but I already have it and I'm not sure if I really need two copies of that film. I also really liked Cat People but again, I just got a copy as part of a Val Lewton collection. 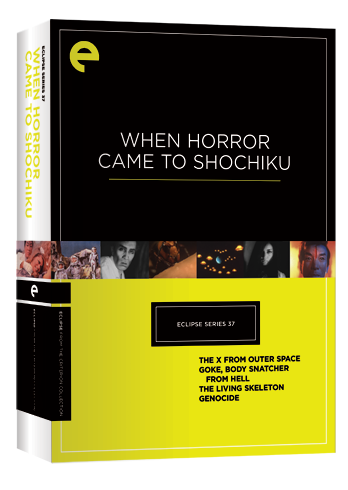 You know what film needs to be released on Criterion? The 1975 version of The Stepford Wives. I love that movie. I have a copy that I got for $3 somewhere, but I would get the Criterion. I am not even a fan of horror or science fiction and The Stepford Wives is kind of a combination of more genres. For whatever reason however, I loved that film. Perhaps it was the "camp" factor. I also really wish they'd redo Topper because there only seems to be a crappy version available. It doesn't appear that this film ever got a proper studio release. It only seems to have public domain releases? The copy of Topper that I have is a low-grade cheapie that comes with Topper Returns. I may place another order, too. I'm thinking of getting the Blu-Rays of The Hidden Fortress, The Manchurian Candidate and Mulholland Drive. I just bought a copy of "Where Love Has Gone" with Susan Hayward and Bette Davis. Looks a bit soapy but I'm a sucker for anything with Bette Davis in it. *Then I took advantage of the Criterion sale at Barnes & Noble and picked up The Philadelphia Story. -Icons of Screwball Comedy Vol 1. This boxed set contains: Too Many Husbands, If You Could Only Cook (both w/ Jean Arthur), My Sister Eileen and She Wouldn't Say Yes (both w/ Rosalind Russell). Christmas is coming up so I'll have to add some more movies to my Christmas list. Lol. I haven't bought any movies lately (which surprises me, to say the least), but I'd like to buy "A Streetcar Named Desire,", "Laura" (1944), "All About Eve" (1950)... The list probably goes on. I just picked up Icons of Screwball Comedy Vol 2. This set features two films from Irene Dunne (Theodora Goes Wild and Together Again) and Loretta Young (A Night to Remember and The Doctor Takes a Wife). I mainly got this set for 'Theodora.' I couldn't believe it when I saw this set at Barnes and Noble, I thought it was one of those things that was only available on Amazon or somewhere else online. At one of my favorite used movie stores, I found 101 Dalmatians (the 1961 Disney cartoon. I love the animation style and the music in this film) and Mary Poppins. At another of my favorite used movie stores, I found: Lifeboat, Courtship of Eddie's Father and a 2-movie set with Woman in the Window and The Stranger, which via the sale and my membership card, I got it for .90! Then I may have picked up one more film during Barnes & Noble's Criterion sale and got Summertime with Katharine Hepburn. They were bought from several sources, like the Barnes & Noble sale, Amazon sales, and directly from the Criterion site. So I was very pleasantly surprised to find a $50 gift certificate from the Criterion site in my e-mail today. I used it to get The Qatsi Trilogy on Blu-Ray. "A singular artist and activist, Godfrey Reggio is best known for the galvanizing films of The Qatsi Trilogy. Astonishingly photographed, and featuring unforgettable, cascading scores by Philip Glass, these are immersive sensory experiences that meditate on the havoc humankind’s obsession with technological advancement has wreaked on our world. 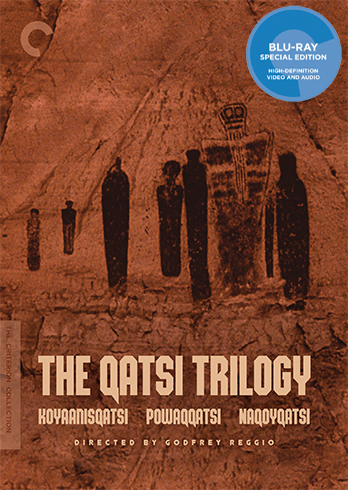 From 1983’s Koyaanisqatsi to 1988’s Powaqqatsi to 2002’s Naqoyqatsi, Reggio takes us on a journey from the ancient to the contemporary, from nature to industry, exploring life out of balance, in transformation, and as war, all the while keeping our eyes wide with wonder." Wow! I wish they'd send me a $50 gift certificate. You must have had to purchase quite a bit from them to receive one. I also got The Philadelphia Story. I haven't watched it yet to determine the quality, I'm sure it's good however, all of the ones I've purchased have been excellent. I've seen All That Jazz, I think it was even the Criterion version that I borrowed at the library. I don't know, maybe I was just the wrong audience for it. I didn't get it. I mean, I understood what was going on and everything, but nothing in the film clicked for me. I just didn't see what the big deal was, I thought the film was kind of strange. The Criterion copy was excellent however. Maybe I need to give this film another chance. I don't know. It was interesting seeing a very young John Lithgow however, and I'd only ever seen Roy Scheider in Jaws, so seeing him in a role like in All That Jazz was very interesting. I've seen All That Jazz, I think it was even the Criterion version that I borrowed at the library. I don't know, maybe I was just the wrong audience for it. I didn't get it. I mean, I understood what was going on and everything, but nothing in the film clicked for me. I just didn't see what the big deal was, I thought the film was kind of strange. The Criterion copy was excellent however. Maybe I need to give this film another chance. I don't know. It was interesting seeing a very young John Lithgow however, and I'd only seen Roy Scheider in Jaws, so seeing him in a role like in All That Jazz was very interesting. I haven't really bought too many from their site directly (most of my purchases happen via the B&N annual sales or from Amazon). They said it was a "loyalty reward". I didn't argue! I like All That Jazz on a number of levels. I enjoy Roy Scheider's performance, which was so unlike the other roles he played. I liked the cinematography, which had a specific late-70's gloss to it. And I can sympathize with how Scheider's character was living his life: the overwork, the pill-popping just to keep going, the toll it was taking on him, the morning rituals of smoking while coughing, the face in the bucket of ice water - there was a time when that was me! Wow! I'm loyal to Criterion too, but apparently not loyal enough. I think I only have eleven Criterion films however. I tracked them to the "My Criterion" thing on my Criterion profile. Maybe Christmastime will bring me more Criterion. Now comes the long November to July wait for B&N to have the 50% off Criterion sale again. Re: All That Jazz, I agree with you about the cinematography. I like a lot of the 1970s films for the aesthetic that many of them have. I didn't think of them as so much "glossy" but as I think about it, that could be true if I think of the "gloss" as sort of an overlay. Many of the 1970s movies have a type of sleaziness about them that isn't present in the early 1960s films. I don't know if sleazy is the right adjective to use here, perhaps "realistic" is better? I don't know, but the color in the 1970s films tends to be a bit flat, almost faded, plus they use grittier locations and less glamorous actors which brings a feeling that you don't get from the late studio-era films. The 80s films start seguing into more computerized, technology-driven plots and locales. While I cannot sympathize with Scheider's character's plight, I did like how he had to psyche himself up to go to work--"It's showtime!" I feel like that often, especially when it's like 25 degrees outside, dark, and my car is covered in frost. Perhaps for me it was everything going on around Scheider that I didn't get. I don't know. Maybe this is a film that I need to revisit. I remember waiting for them to sing "All That Jazz" until about halfway in, I realized that that song was from "Chicago" and it probably wasn't going to be in the film. Re: All That Jazz, I agree with you about the cinematography. I like a lot of the 1970s films for the aesthetic that many of them have. I didn't think of them as so much "glossy" but as I think about it, that could be true if I think of the "gloss" as sort of an overlay. Many of the 1970s movies have a type of sleaziness about them that isn't present in the early 1960s films. I don't know if sleazy is the right adjective to use here, perhaps "realistic" is better? I don't know, but the color in the 1970s films tends to be a bit flat, almost faded, plus they use grittier locations and less glamorous actors which brings a feeling that you don't get from the late studio-era films. The 80s films start seguing into more computerized, technology-driven plots and locales. While I cannot sympathize with Scheider's character's plight, I did like how he had to psyche himself up to go to work--"It's showtime!" I'll have to look at that My Criterion feature. I don't know if I want to admit how many I have...it's a lot! I know what you mean about the "sleaze" look. I associate that more with early to mid 70's movies, starting back to Midnight Cowboy in '69. All That Jazz has more of a disco aesthetic, like Xanadu, but not as outrageous! I should also point out that I'm not a big musical fan, so liking All That Jazz may be that it appeals to the non-musical fan in me. What's funny, is that All That Jazz is often classified as a musical. I love musicals and one of my friends who also loves musicals, also loves this film. After I got done watching it, I was disappointed that there really weren't that many songs. There's the song for the show that they're creating and there's the part at the end when he's dying, but it wasn't a typical musical. I love Xanadu. Roller Boogie is equally as amazing, but since it doesn't have Gene Kelly in it, I'm giving Xanadu the edge. I wish that TCM would show Skatetown USA-- It has Maureen McCormick, Scott Baio and even Patrick Swayze! Seeing this film, I feel would complete my trifecta of roller disco movies. I just went through that "My Criterion" page and compiled all of the titles I have - 186! Wow! You must have the whole collection. They're numbered on the spine. The newest batch of releases brings the number up to 912, but that doesn't include the Eclipse sets. I didn't even realized they were numbered. Well I guess 186/912 isn't nearly all of them. I don't think I need all 912 of them, most of the selections I have never even heard of. Are the Eclipse sets the ones that come in the white boxes? At the Portland B&N that I usually go to, they have the Criterion in the white boxes separated from the rest of the Criterion.